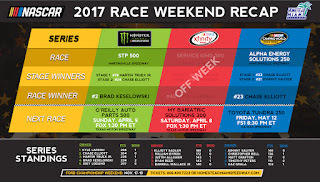 · Brad Keselowski won the 68th annual STP 500 Monster Energy NASCAR Cup Series race at Martinsville (Va.) Speedway Sunday afternoon. For Keselowski, it is his 23rd victory in 275 Monster Energy NASCAR Cup Series races. Keselowski becomes the first repeat winner of 2017, having also taken the checkered flag in the second race of the season, on March 5 at Atlanta. · For Keselowski, it is the fifth straight race in which he has finished in the top-5 dating back to his win at Atlanta, the longest such stretch of his career. · It is Keselowski’s first win in 15 starts at Martinsville Speedway. It is also his ninth top-10 finish and fifth top-5. His previous bests at Martinsville were a pair of second-place showings, on March 29, 2015 and October 30, 2016. · Keselowski provided Ford its first win at Martinsville in 29 races. Prior to today, the last win by a Ford at Martinsville was by Kurt Busch on October 20, 2002. Ford now has won three of the six races of 2017. · Kyle Busch (second) posted his third top-10 finish in six races this year, and his third in as many weeks. It was his 13th top-10 finish and 12th top-5 in 24 career Monster Energy Series races at Martinsville Speedway. Busch led a race-high 274 laps today, marking the seventh time in the last eight races at Martinsville that the driver who led the most laps did not win the race. · Chase Elliott (third) posted his first top-10 finish in four career Monster Energy Series races at Martinsville Speedway. · Erik Jones (12th) was the highest finishing rookie. · For 2017, NASCAR has introduced a new stage format in all three national series where each race is segmented into three stages. In addition to the points awarded at the end of a race (Final Stage), points are also awarded to the top-10 finishers of the first two stages (Stage 1 & Stage 2). 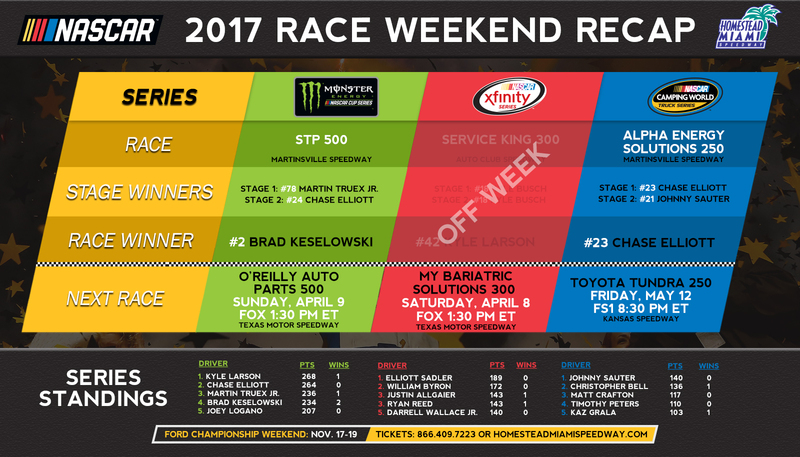 · Martin Truex Jr. won Stage 1 of the STP 500, while Chase Elliott took the green-checkered flag in Stage 2. · Kyle Larson (268) leads the point standings by four points over Chase Elliott (264). They are followed by Martin Truex Jr. (236) and Brad Keselowski (234). · Through six races of the 26-race regular season, five drivers have qualified for the 16-driver field of the 2017 Monster Energy NASCAR Cup Series Playoffs, a list consisting of Kurt Busch, Brad Keselowski, Martin Truex Jr., Ryan Newman and Kyle Larson, each of whom has won at least one race this season. The Playoffs culminate with the Ford EcoBoost 400 championship finale on November 19 at Homestead-Miami Speedway. · In nine career Monster Energy NASCAR Cup Series starts at Homestead-Miami Speedway, Keselowski has posted three top-10 finishes, including two in the top-5. He celebrated his lone career Monster Energy NASCAR Cup Series championship following the Ford EcoBoost 400 in 2012. · Chase Elliott won the 19th annual Alpha Energy Solutions 250 NASCAR Camping World Truck Series race at Martinsville (Va.) Speedway on Saturday afternoon. It is Elliott’s second victory in 12 career NASCAR Camping World Truck Series races. · It is his first victory and third top-10 finish in four career Truck Series races at Martinsville Speedway. He also captured Stage 1 of the race. · Johnny Sauter (second) posted his second top-10 finish in three races this year. It was his 10th top-10 finish in 19 career Truck Series races at Martinsville Speedway. He also won Stage 2 of Saturday’s race. · Christopher Bell (third) posted his second top-10 finish in three career Truck Series races at Martinsville Speedway. · Noah Gragson (fourth) was the highest finishing rookie. · With one win apiece this year, rookie Kaz Grala and Christopher Bell have qualified for the 8-driver playoff field in the 2017 NASCAR Camping World Truck Series Playoffs. The Playoffs culminate with the Ford EcoBoost 200 NASCAR Camping World Truck Series championship race at Homestead-Miami Speedway on Friday, November 17. · Johnny Sauter (140) leads the NASCAR Camping World Truck Series points standings by four points over Christopher Bell (136). They are followed by Matt Crafton (117) and Timothy Peters (110). · The NASCAR XFINITY Series was off this weekend. They will resume action on Saturday, April 8 with the My Bariatrics Solutions 300 at Texas Motor Speedway.